A while back, I had the pleasure to photograph Chez in the beautiful Faena Hotel in Miami Beach. It was a pretty windy day but it made for some dramatic skirt swirls and romantic hair blowing in the air! Sign up with your email address to stay updated with news, plus my beloved b/w preset “Newspaper” as a welcome gift. Karol and I have collaborated multiple times, as you can see. This time, we went to Calle 8, in Miami and had a lot of fun exploring the area. 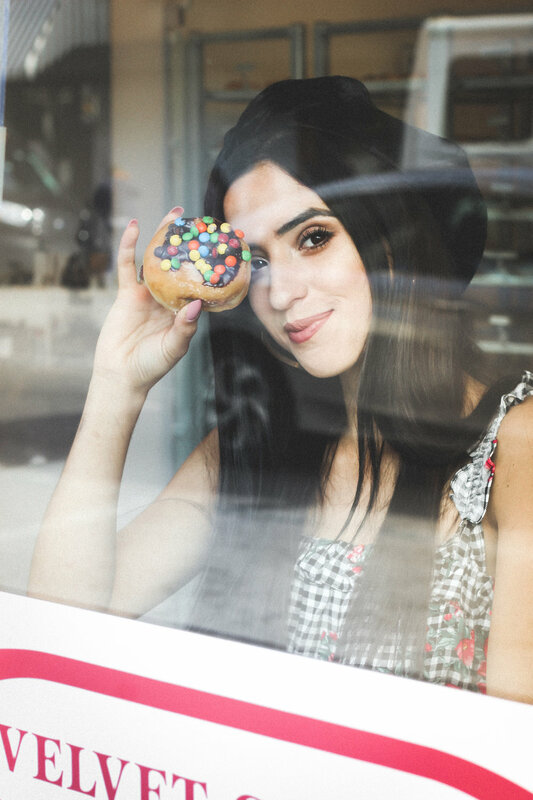 We found this super cute doughnut shop: Velvet Creme! Luckily, they let us had our photoshoot in there! Last week, I challenged myself to carry my camera everywhere I went. I was pleasantly surprised at how my eye was always searching for photo-worthy moments, and most importantly, I felt incredibly inspired and creative. I took hundreds of pictures and picked my 7 favorites that I also posted on my Tumblr, Facebook and Flickr. Check them out! My trusty bike, a Huffy, already getting rusty, but still a beauty. A delectable iced chai latte, at Panther coffee, a cool coffee house in Sunset Harbor, Miami Beach, FL. I fell in love with this bright pink bike I spotted walking in Lincoln Road, Miami Beach, FL. The Lincoln Theatre, a stunning example of art deco architecture, in Lincoln Road, Miami Beach, FL. Walking through my neighborhood, in Miami Beach, FL. Teeny tiny cupcakes, in Panther Coffee, a cool coffee shop in Sunset Harbor, Miami Beach, FL. Walking through Lincoln Road, at night. Camera gear: Canon Rebel t3i, lens 50mm f1.4. Edited in Adobe Lightroom. Cupcakes and Chai latte edited with the Limelight Collection, Huffy Bike and Walking through my neighborhood edited with the Velour Colors Collection, Lincoln Theatre, Bright Pink Bike and Lincoln Road at night edited with the Sunset's Fringe of Gold Collection. Miami Beach is completely decked out in lights! There's a wonderful festive spirit everywhere that has me definitely excited about Christmas (Is it next week, already?). Every year, I leave all my gift shopping until the last minute, and this year is not the exception! But hopefully, I'll get everything done this weekend, so I can relax and enjoy the holiday. In the meantime, this is how South Beach looks during Christmas season. Enjoy! On my quest to discover more of Miami, I decided to finally visit Vizcaya Museum & Gardens, a national landmark and former winter home of agricultural industrialist James Deering. It's impressive to say the least, full of history and incredible architectural details. Inspired by Venetian and Tuscan Italian Renaissance elements, the villa and its gardens are a must visit if you're in Miami.